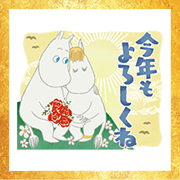 Delight your LINE chats with stickers from the animated TV series Moominvalley. Find your favorite Moomin characters in a brand-new 3D look, complete with useful phrases for daily life. 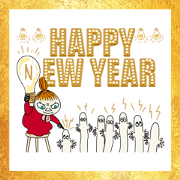 Gorgeous New Year’s omikuji stickers just brimming with gold. This set features the Moomins and Little My with polite messages. Omikuji lasts from December 27, 2018 to January 3, 2019. Welcome 2019 with the residents of Moominvalley! These soft watercolor stickers will help you spread New Year’s cheer this holiday season. Omikuji lasts from December 27, 2018 to January 3, 2019.